SPRING VALLEY, Minn. — June 22, 2017 — The World of Outlaws Craftsman Sprint Car Series returns to Deer Creek Speedway in Spring Valley, Minn., on Thursday, June 29 for the Asgrow/Dekalb Clash at the Creek. The series last visited the track in 2015, with Brad Sweet picking up the win. Each of the last six races for the Outlaws at Deer Creek have seen a different driver pick up the win. This year’s edition of the Clash at the Creek will be the final race of the season in the state of Minnesota for the “Greatest Show on Dirt.” This edition of The Breakdown sets the stage for the Asgrow/Dekalb Clash at the Creek for the World of Outlaws Craftsman Sprint Car Series at Deer Creek Speedway on June 29. Deer Creek Speedway is a high-banked, three-eights-mile. The track record of 11.474-seconds was established by David Gravel on September 13, 2014. Brad Sweet was victorious in 2015 at Deer Creek Speedway, taking the lead from his Kasey Kahne Racing teammate Daryn Pittman on the third lap and holding off a hard-charging Donny Schatz down the stretch. Paul McMahan won at Deer Creek in 2014, while Australia Ian Madsen won his first-career World of Outlaws Craftsman Sprint Car Series race at the track in 2013. Craig Dollansky, who hails from Elk River, Minn., won in 2012 at Deer Creek, with 20-time series champion Steve Kinser adding the track to the amazing list of venues that he has won at in his career, in 2012. Joey Saldana won each of the first two World of Outlaws Craftsman Sprint Car Series events at Deer Creek in 2009 and 2010. He is the only driver to have more than one win at the track with the series. The World of Outlaws Craftsman Sprint Car Series has 16 card-carrying members this year, led by Donny Schatz. Brad Sweet is currently second in points, with David Gravel just a few points behind him in third. Sweet teammate Daryn Pittman is fourth in the standings, with Shane Stewart rounding out the top-five. Jason Johnson currently rides sixth in points, with rookie Sheldon Haudenschild seventh, Joey Saldana eighth, Logan Schuchart ninth and Jason Sides 10th. Also on the road this year are veteran drivers Paul McMahan, Kraig Kinser and Greg Wilson, as well as young drivers Jacob Allen, Clyde Knipp and rookie Brent Marks. Donny Schatz has finished seventh or better in all seven of his starts at Deer Creek Speedway as he chases his first win at the track. Daryn Pittman has only made three starts at the track, but has finished in the top-five in all three of those races, as he too looks for his first win at Deer Creek. Jason Sides has made a handful of starts at Deer Creek in his career. Shane Stewart made his first ever start at Deer Creek Speedway in 2015. The driver of the No. 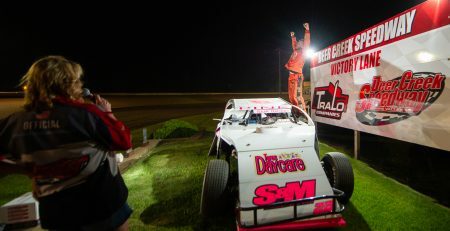 2 machine for the Larson Marks Racing team is a past winner in Minnesota at Granite City Speedway near St. Cloud. Jason Johnson, the 2016 winner of the Knoxville Nationals, also made his first appearance at Deer Creek in 2015, picking up a top-10 finish. 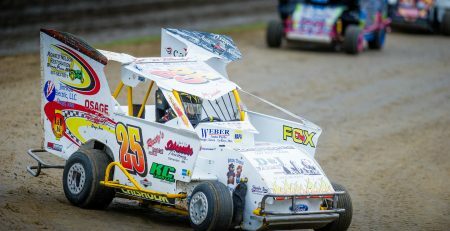 A group of young drivers is leading the next wave of World of Outlaws Craftsman Sprint Car Series competitors. Leading the way is Connecticut native David Gravel, who has nine wins this season. Gravel will be making his fourth start at Deer Creek Speedway and has two straight top-five runs at the track. The Shark Racing team of Logan Schuchart and Jacob Allen are on the road again this season. 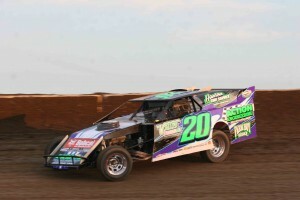 Allen finished sixth at Deer Creek Speedway in 2015, after racing his way into the top-three in the latter states of the race. Greg Wilson, the defending Kevin Gobrecht Rookie of the Year Award winner, will be seeing Deer Creek Speedway for the first time, as will teenager Clyde Knipp from Missouri. Knipp is in his first full season with the series, after joining the tour last summer, after graduating from high school. Sheldon Haudenschild from Ohio and Brent Marks from Pennsylvania will each be making their initial start at Deer Creek Speedway. Among the “invaders” expected at the Asgrow/Dekalb Clash at the Creek are Ian and Kerry Madsen. Each of the Australian-born brothers has a victory with the World of Outlaws Craftsman Sprint Car Series this season in the state of Minnesota, with those coming in the Jackson Nationals at the Jackson Motorplex earlier this month. Brian Brown, who won with the Outlaws in Arizona back in the spring, is also tentatively scheduled to compete with the series at Deer Creek Speedway. 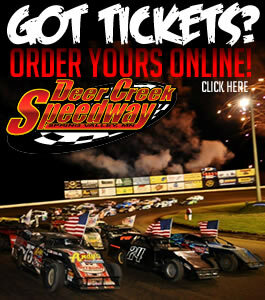 Tickets for the Asgrow/Dekalb Clash at the Creek, featuring the World of Outlaws Sprint Car Series at Deer Creek Speedway on Thursday, June 29, 2017 can be purchased online at slspromotions.ticketforce.com or by phone at 815-344-2023 and at the track. Bring-A-Newbie Bonus! NEW PROGRAM for the Featherlite Fall Jamboree!